To earn the Corrections Officer Certificate in Suicide Prevention, more work is required. The learner must complete up to an additional 6 hours of online training in this same course. Completing and passing the quizzes in these additional modules qualify the learner to print the Corrections Officer Certificate in Suicide Prevention Certificate. The price for the shorter or longer course is the same, and we encourage all learners to complete the full course if possible. The final exam is a national 25-item test that few health care or mental health professionals can pass without completing this course. As of this writing in 2017, the Institute has trained more than 15,000 Certified Gatekeeper Instructors who have, in turn, trained more than 2.5 million gatekeepers worldwide. In addition, thousands of clinical healthcare providers have been trained in how to detect, assess, and manage suicidal consumers. The primary mission of the QPR Institute has been to provide technology transfer of evidence-based knowledge into useful skills and helpful interventions for those wishing to assist suicidal persons. To this end, the Institute has developed comprehensive training programs to address the training deficits among clinical providers as outlined in the US National Strategy for Suicide Prevention, and to provide customized suicide prevention training to match the service setting and the levels of duty professionals in those settings have for the health safety of those they serve both in the US and abroad. Modularized in a rich mix of text, video, voice-over PowerPoint™ lectures, interactive practice sessions, and other state-of-the-art interactive and e-learning technologies. 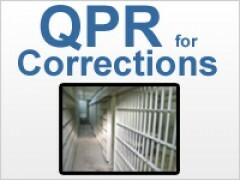 The QPR for Corrections training program provides two certificates. The basic QPR Gatekeeper Training for Suicide Prevention requires 90 minutes to 2 hours of training. The Corrections Certificate in Suicide Prevention requires hours of training and passing a final exam. If the learner passes this national exam, he or she will have demonstrated more knowledge about suicide and its prevention than a large majority of mental health professionals. By completing all 6 hours of training, volunteers, students, and paid professionals may earn the "Corrections Certificate in Suicide Prevention." The fee is the same for the QPR Gatekeeper Training for Suicide Prevention (shorter program) and the Corrections Certificate in Suicide Prevention (longer program). When both sections are passed, the leaner is awarded the final certificate.